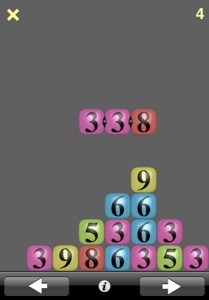 ArithFit is a fun educational game for iPad, iPhone, and iPod touch. 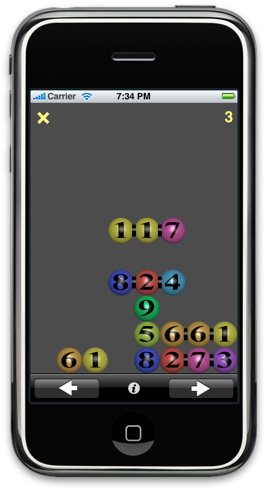 It trains simple Arithmetic skills and can be adapted for everyone from preschool children to adults. 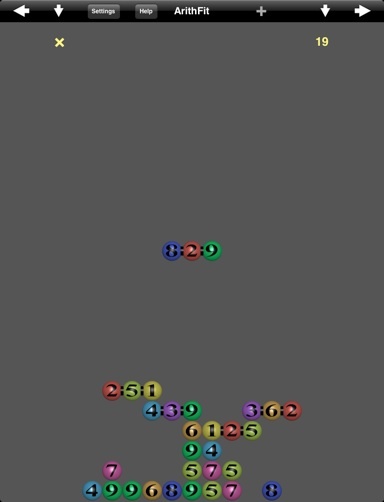 Its name is short for "Arithmetics Fitness", and it keeps you fit by letting you continually build new sums (or multiplications even) to keep a pile of colorful objects from growing. ArithFit will improve the Arithmetics skills of anyone while delivering a fun entertainment to both children and adults. The rules of the game can be customized to adapt them to any level of skill. 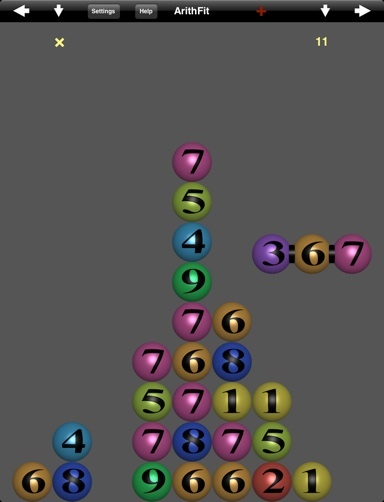 Three numbers attached together fall down from above and while they fall they can be pushed left or right to change the place where they land. 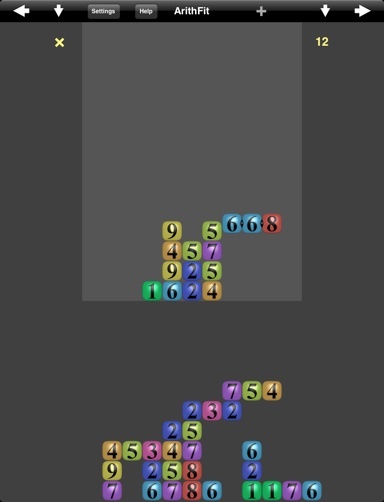 These numbers keep piling up at the bottom unless they can be combined with numbers that are already there in such a way that the sum of all numbers is 10. 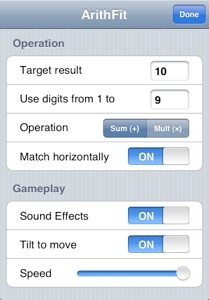 But this setting can be changed to make the game easier (for smaller children), by choosing a sum to a smaller number, or to make the game more challenging (for more advanced players), by choosing a sum to a larger number. Or make it even more difficult by choosing to do a multiplication instead of a sum. The possibilities are endless: some will be too easy, while others will be too difficult or impossible. 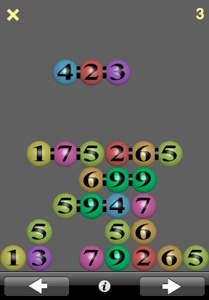 Several other parts of the game can be customized: You can move the falling triplet of numbers to the left or to the right by tilting your device instead of using buttons, you can allow "horizontal matching" to also combine the numbers horizontally instead of only vertically, you can change the speed with which things happen, choose another graphical theme for the display, etc. A totally different experience, more flexible, more challenges!